In 1907, when the streetcar travelled down this part of Government Street, there was a different building here. The long-time home of Jacob Sehl’s B. C. Furniture outlet was occupied by W. Bownass Hardware Store. The building site was originally part of Fort Victoria and is almost exactly between the chief factor’s residence and the men’s quarters. Following the dismantling of the fort in 1864, the land was sold and brick commercial buildings went up. In July 1909, citizens of Victoria learned of the “fine premises for Royal Bank” that would soon grace Government Street, immediately south of the premises occupied by A. E. Morris. This Edwardian Classical bank building combines a Roman entrance-arch with Tuscan columns and Renaissance pilasters in a glorious interpretation of the dignity of the Edwardian bank. Built with two storeys, the basement contained a shooting gallery where bank employees could be prepared to cope with a hold-up. The second storey was removed in the 1980s and the main features of the original banking hall obscured. 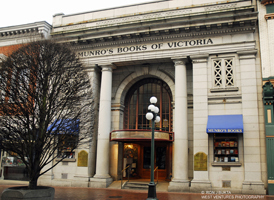 Book seller Jim Munro purchased the bank in 1984 and, within seven months, had restored the former banking hall for use as a bookstore. During the process, he uncovered original plaster that had been hidden in the 1980s and uncovered other fine features. The book store continues in the same location today.